The Dorset Olde Tyme Bulldogge is a medium-size dog that stands proud and out from the rest fearless, confident, alert, yet docile, showing great strength, it is a real powerhouse that attracts stares and comments. His strong, hard athletic physique is still close-coupled and compact enough to promote the traditional bulldog looks that are common with regards to his breeding, making him stocky, athletic and imposing. The shoulders are muscular and slightly sloping, fore legs are straight, well boned and set well apart, elbows turned neither in or out, feet broad strong, toes tight, nails curved and strong, pads thick and tough. 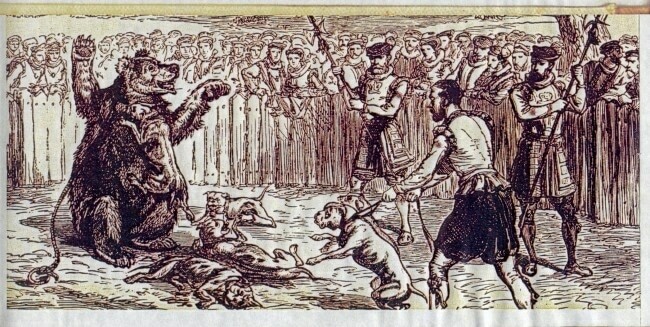 The hindquarters are broad and muscular, with well-developed second thigh denoting power, but not cumbersome, moderate angulations at hocks; cow hocks and splay feet are serious faults. His gait is powerful, heavy, with good drive from the hindquarters. A straight or pump handle tail is preferred and most desired, but crank and corkscrew are accepted. 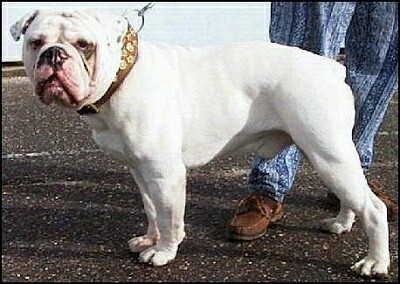 The Dorset Olde Tyme Bulldogge has a large, strong head; the upper region of the head is slightly convex from one side to the other, the forehead dominates the face, however it is still wider than high, the head is furrowed, with loose thick and wrinkled skin about the throat and side of head, cheeks: prominent, due to the strong development of the muscles, broad muzzle: with obvious folds, broad and deep, keeping its length in comparison with that of the entire head. 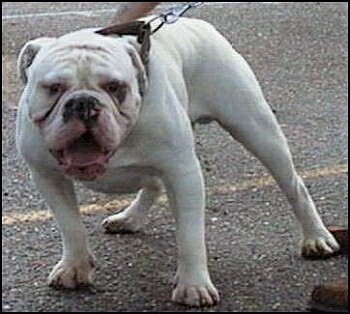 The nose is broad, with well open nostrils; lack of fore face with nostrils set on top of muzzle is a reversion back to the kennel club bulldog and is very undesirable. Care is taken to keep the traditional strong bulldogge head, allowing short strong enough muzzle to not hinder breathing while still keeping the solid close-coupled broad set bulldog looks. The body is compact. The chest is wide and deep with ribs well sprung and well set down between the fore legs. The back is short, giving the impression of a well-balanced dog. The neck is slightly arched, of moderate length, very muscular and almost equal to the circumference to the skull. The topline is solid with a broad and muscular back, withers well marked, broad loin, rather short and solid. The ears are set high and wide, rose preferred, button is accepted. The coat is of fine texture, smooth flat, short coat desired, similar to the glossy sheen of the Stafford, double or oily coat un-desired. Any color acceptable, Dorsets are bred in variations of brindle, variations of pied, also black and slate gray-blue; the slate gray blue's known as Dorset Blue poole's, as a respect and tribute to the original blue Paul (pol) of Scotland, and the area of Poole in Dorset. This breeding is still at the early stages of Steve's breeding program, and have only just after a few years started to reproduce type in color. 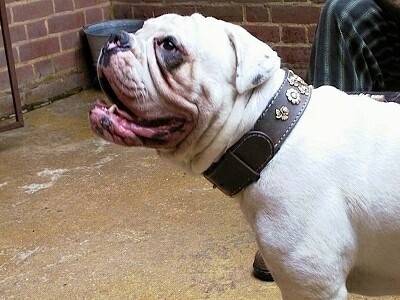 The Dorset Olde Tyme Bulldogge is a very good all-around family member, loyal among the children and keen to please and be part of the family circle, not homed as a guardian, but determined protector nonetheless. Keen to lie at your feet or walk at your side, a good companion very attached to his master and very affectionate; longs for leadership and to be loved. They are usually good with non-k-9 pets, especially when raised with them from puppyhood and they usually get along well with other dogs; socialize well. Be sure you are this dog’s calm, but firm, confident and consistent pack leader, providing daily mental and physical exercise to avoid unwanted behavior issues. 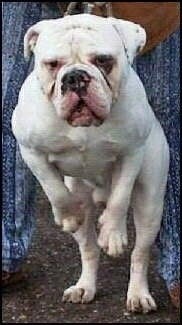 Preferring a strong, stocky muscled physique—height and weight should be in keeping with a symmetrical, well-proportioned body, keeping the appearance of strong traditional bulldogge looks. 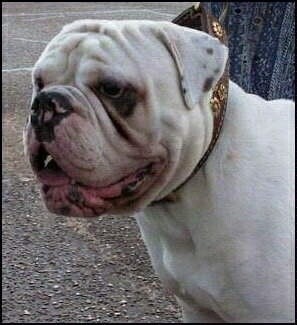 The Dorset Olde Tyme Bulldogge can live indoors or out. If they are kept outdoors they will need the benefit of a good, dry draft-free kennel. They will do fine in an apartment. This Bulldogge can handle any amount of exercise. They are keen to lie at your feet or walk at your side, but like all dogs, need to be taken on a daily walk to fulfill their primal canine instinct to walk. Coat care can consist of a daily wipe over with a cloth or soft brush; care should be taken to make sure all wrinkles around the muzzle are free from any dirt or staining.